Between 1 April and 30 June 2016, Mapping Media Freedom’s network of 18 correspondents and other journalists submitted a total of 341 verified reports of violations of press freedom to the database, a 13% rise over the first quarter of 2016. The platform — a joint undertaking with the European Federation of Journalists and Reporters Without Borders, partially funded by the European Commission — was established in May 2014 to document threats to media freedom across Europe. It covers now 42 countries, including all EU member states, plus Albania, Azerbaijan, Belarus, Bosnia and Herzegovina, Iceland, Kosovo, Macedonia, Montenegro, Norway, Russia, Serbia, Turkey and Ukraine. and media professionals were blocked from covering a story in 73 incidents. The report is also available in PDF format:. The article was originally published by the European Federation of Journalists. 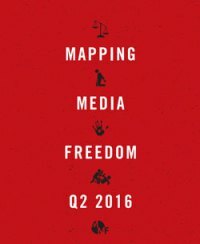 Be the first to comment on "Mapping Media Freedom report: journalists increasingly attacked in Europe"